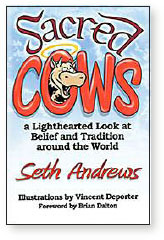 A review of Sacred Cows: A Lighthearted Look at Belief and Tradition Around the World, by Seth Andrews. 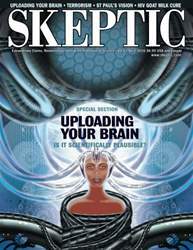 THOSE OF US WHO READ EXTENSIVELY IN the field of comparative religion are familiar with many of the world’s bizarre beliefs, cultures, and religious practices. But most Americans are alarmingly insular, especially if they’ve been raised in a small town and taught to think only one way by their church. Even in the relatively liberal Presbyterian church in which I was brought up, serious discussions of other religions were taboo, unless that exposure was simply to mock and condemn the other beliefs like we did in my high school church group where I learned about other “cult” religions such as Jehovah’s Witnesses, Mormons, Christian Scientists, and Scientologists. Most Americans continue to grow up without thinking very deeply about other religions, or questioning the assumptions of their own faith.